The ranch is located eight miles east of Holbrook, Arizona directly south of and adjacent to Interstate 40 and stretches from two miles east of the Sun Valley exit, east to the Petrified Forest National Park. 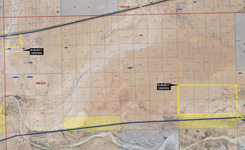 The Headquarters is located seventeen miles northeast of Holbrook, and is accessible beginning at Exit #289 on Interstate 40 in Holbrook, travel eastbound 13.5 miles to Exit 303 (Adamana Rd), stay on south side of I-40, turn east on Adamana Road (frontage road), travel east 0.1 miles to Sun Country Road (dirt), turn south and drive 1.2 miles then turn east on Cattlemen’s Road. Drive east 0.7 miles to sign reading “Goodwater Cattle Co.” turn south and travel 0.3 miles to locked gate and ranch headquarters site. The tenure of Goodwater Ranch is in a long narrow strip of rangeland being between two and four miles wide (north to south) and twelve miles long (east to west) with Arizona State and BLM lands being mixed with large areas of open range for use as adverse grazing. These are private lands owned by numerous different landowners, some with scattered houses on the property. The range is considered open range or adverse grazing as the properties are available for grazing use while not fenced. 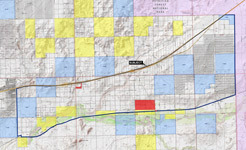 The northern boundary of the ranch is I-40 and the south boundary is the Santa Fe Railroad. The dominating topographic feature is the Puerco River lying adjacent to the railroad. The ranch is mainly rolling grassy hills with wide sweeping draws falling southward to the river bottom. Elevation ranges from 5,300' to 5,800', and the Headquarters situated at 5,400'. Topography is sloping to rolling to mesas. Vegetation is Plains & Desert Grassland. 2,128 sq. ft. doublewide mobile home affixed, four bedroom, two bath, two car garage, with a 340 sq. ft. built-on porch. 1,200 sq. ft. site built single family home, four bedroom, one bathroom, of cinder block construction with concrete foundation and floors, asphalt shingle roof and a 200 sq. ft. porch. 400 sq. ft. meat house with cutting counter tops and an 8’ x 12’ walk in freezer. Building is of wood frame construction with wood flooring, wood siding and a shingle roof. 180 sq. ft. storage building with wood frame, wood siding, metal tin roof and dirt floors. 704 sq. ft. shop/barn building of wood frame, wood floor, wood siding and a metal roof. 880 sq. ft. livestock barn with built in horse stalls attached to outside runs, a 1,375 sq. ft. equipment shed is attached to the back side of the livestock barn and is all inclusive under one roof. 184 sq. ft. livestock shed with three walls, wood frame, metal roof and dirt floor. Additional livestock improvements include a large set of working corrals mostly of steel pipe construction with numerous holding pens, loading chute, working alleys and a five ton scale. Corrals and horse pens have water piped to numerous locations throughout the headquarters site. *deeded, private lease and adverse grazing capacities are based on the State recommended stocking rate of 7 head per section. The 2018 State Grazing Lease fee is $2.81 per head per month. The Federal lease fee is $1.41 per head per month. Tours-Navajo-Trail association: Deep soils on floodplains; Palma-Clovis association: Deep soils on old alluvium on uplands; and Rough broken and stony land - Rock outcrop association: Very steep stony land and sedimentary rock outcrop on uplands. Holbrook Arizona, average annual precipitation 8.5 inches. Weather information supplied by the Arizona Department of Commerce from the Western Regional Climate Center, period of record 1893 to 2005. Telephone and electrical service area available to the headquarters site. 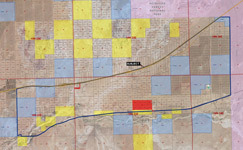 Navajo County zoning on the property is Agriculture General. This is the county’s general rural zoning that allows for a wide variety of uses such as single family residential on minimum lot size of one acre, farms, corrals, golf courses, plant nurseries, and some commercial. It includes the largest percentage of acreages in the county and is considered to be a holding zone until a higher use is approved. Flood Zone: The subject deeded lands are contained within the boundaries of the FEMA flood map #04017C3400E. Nearly all of the property is located within flood Zone A which is a special flood hazard area, subject to flood inundation by the 1% annual chance flood, no base flood elevations determined. This area includes the building sites, all buildings are located within Zone A.